My Husband, M is off for 10 days and I thought I would catch up with some girlfriends without the Lil Tiger. So today I caught up with a bunch of girlfriends for coffee. So off I went for 2 hours with my girlfriends. When I got home, I asked M if everything was ok and did the Lil' Tiger need the bottle and he said yes and all was good. Then I went into the kitchen to get a glass of water, I saw the stock pot out filled with water and the empty baby bottle on the side. Curious, I asked M why the stock pot is out. "I used it to heat up the bottle," he said. "Well you said boil water and put the bottle in the hot water until the milk is warm" he continued. "Ermm....I assumed that you would boil a kettle of water and pour it into a cup and put the bottle in there. Not boil a put of water and stick the bottle in there. I showed you once before and how did you manage to fish it out?" I said nearly burst out laughing. "I used the barbecue thongs. No wonder instruction no 2 didn't make any sense at that time". At this point, I was laughing. I guess it made sense to him to boil water in a stock pot because I have been sterilising the Lil' Tiger's bottle in boiling water in a stock pot. 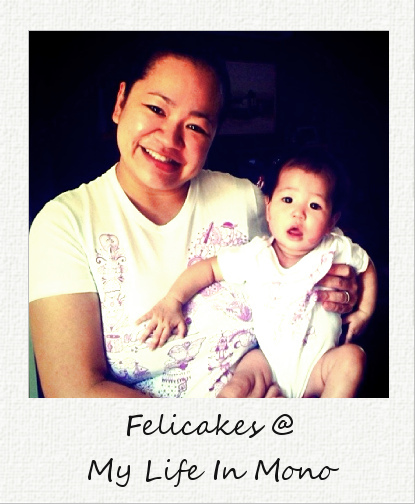 The delightful Miss Feli is a legal secretary by day and blogger by night. She has been blogging at My Life In Mono since 2004! She juggles full time work, blogging and her obsession with Twitter and Facebook at the same time as being a mama to the adorable Lil Tiger (naww, isn't she scrumptious!!!). When she gets a minute to herself she dabbles in sewing, crafting and crochet and this year aims to find the meaning of Life, Love and Laughter all whilst balancing a baby on her hip. This is exactly why Mr Fussy is not allowed in the kitchen. I'm always amazed at how men seem to lose their ability to think logically when doing anything involving the care of babies. Give my husband an electrical or computer problem & he's in his element. Ask him to tend to a basic need of a child (like remembering to feed them while I'm out) and he's completely lost!! Ha ha..I can so relate to this! Classic! Love that he used BBQ tongs to get it out. Aww, I can so see my husband doing this! It is simply amazing how inventive they are. Or is that.. reinventive? I should have known that they don't read manuals! hahahaha... but it was pretty interesting.